First, The Sugar House is now available on Nook, or the various Nook reader applications. You can find it here or on Amazon here. Second, I talked a little bit in my last post about my goals as a writer for the setting of The Sugar House, but I didn’t really talk about what it is or my inspirations. 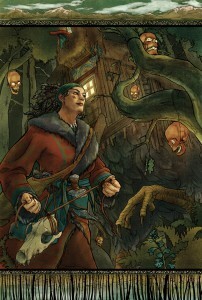 The Sugar House takes place in the ancient and dark forests from European fairy tales. The woods cover virtually all of Europe, and it’s possible to travel from Russia to France without ever really leaving them. I’m not sure that the forest is malignant, but it’s dangerous, and human settlements are constantly in danger of being retaken. Towns are mostly very small. I took a lot of inspiration from Tanith Lee’s Kill the Dead, in which none of the explored settlements are very large. I love giant fantasy cities, but there aren’t many of them here, and Sasha would generally find them appalling. So there are a lot of little collections of huts and farms, with log-paved roads and skinny livestock. Magic is rough, ready, and bloody. A lot Sasha’s magic is based on knowing the secret ways of the world… like that a certain spirit is repelled by rotting meat. And that spirit isn’t some phantasmal inhabitant of the otherworld. It’s likely to be a physical being, in the way that the creatures of folklore tend to be. The way that Sasha’s magic is essentially cheating, and its dark overtones, are inspired a lot by Hellblazer. And then there are witches. Ancient, eerie, possibly pre-human, they exist beyond the boundaries of humanity. Sometimes they give mortals what they desire. Sometimes they give their blessings to infants. And sometimes, very rarely, a witch will have a child with a human. 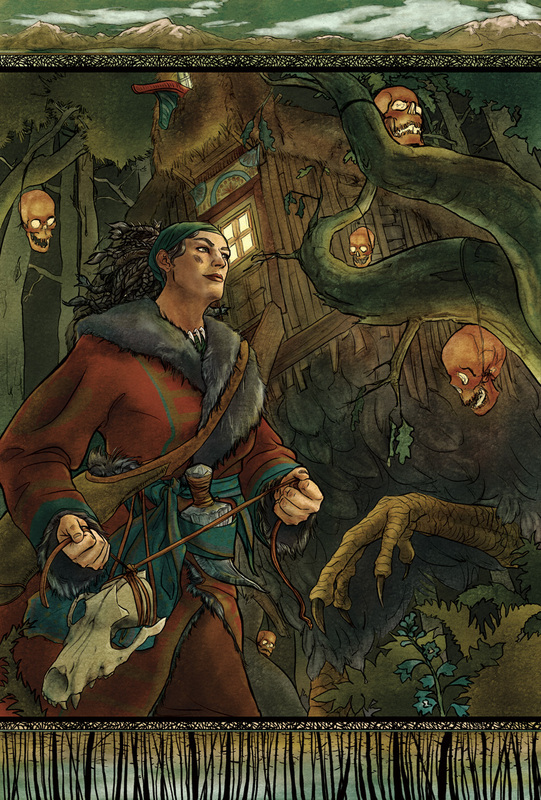 Sasha’s father was the son of Baba Yaga, and Sasha’s heritage weighs heavily in her story. The chief inspiration for my witches was Baba Yaga herself. She’s characterized as a witch, but there’s never any indication that she learned to be one, that she has a secret origin. She both helps and harms the protagonists of Russian fairy tale. I decided to play with that a little… why is it always the lost child who seeks help in the otherworld? Why not the big, bad wolf? Sasha’s world is, in general, not a place of categorizable phenomena. There’s a lot of Howard in that, Solomon Kane1 as much as Conan. The supernatural tends to be unique and local. When you journey through the forest, there’s no telling what you’ll find. And then there’s Sasha’s character herself. But that’s probably another post.